The other night I was at a dinner at my friend Nadia’s place here in Florence and she had her friend, Betta, from close to Vicenza visiting. They are both originally from the Vicenza area. At a certain point, they were asking me about my recent ‘wine travels’. When I mentioned that I had been visiting Angiolino Maule in Gambellara some month ago, to learn more about Vin Natur, Betta’s eyes started shining saying like…wow…Angiolino Maule and Vin Natur are the best. Joking aside, let’s now get a bit more serious and down to business talking about the Vin Natur (Natural Winemakers’ Association). 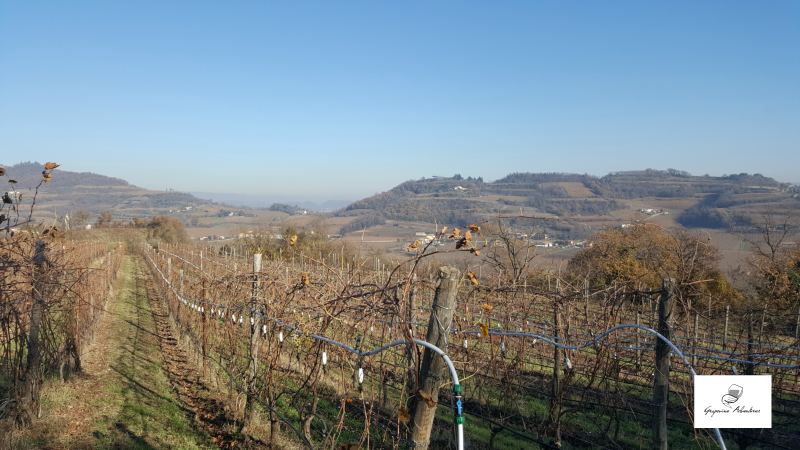 In early December last year, I was invited on a press tour to meet with Angiolino Maule, the president of Vin Natur, at his winery La Biancara in Veneto. We were a small group of wine writers who, after Wine2Wine in Verona, were whisked off to Gambellara in the province of Vicenza. Even though I knew about the Association of Natural Winemakers, Vin Natur, I did not really know that much about their history and what they do. 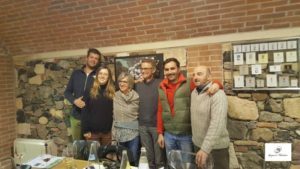 It turned out to be a wonderful visit, a true immersion into the world of natural wines lead by Angiolino Maule and some other members of the association. Did you know that Angiolino Maule used to run a pizzeria together with his wife before he decided to become a winemaker? In the late 1980s, he decided to leave the pizza days behind and instead try making wine at his new wine estate La Biancara. He told us that he was very idealistic in the beginning thinking it would be fairly easy and straightforward to make wine. Little did he know though…that it was the complete opposite. Angiolino believed in natural winemaking already from the start so they have never been a conventional winery. However, he is the first to admit himself that La Biancara, in the beginning, produced wines with a lot of defects that were not much fun to drink. They did not know how to make them better and eliminate the fastidious defects. 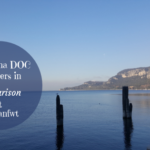 Slowly he started realizing that he could not do it on his own but that he rather needed a network or a community of winemakers to exchange experiences with. In early 2000, he started working on setting up the association which in 2006 would officially become Vin Natur. 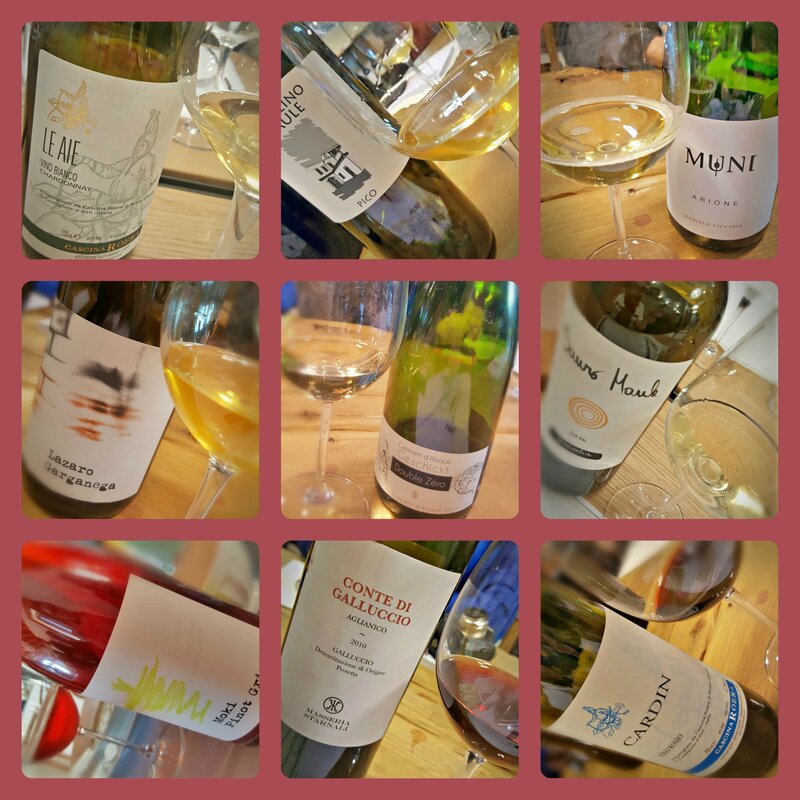 His aim was to involve winemakers from several European countries, such as France, Spain, Slovenia, etc., in order to together start working for better natural wines. The French were considered to be at the forefront of natural winemaking. So, what were the problems back in the early 2000s that they needed to find an answer to? Well, basically they were very good at working the vineyard but quite bad at handle things in the wine cellar. One of the main problems was how to deal with the malolactic fermentation without using any chemical products. Therefore, the first years of Vin Natur were dedicated to studying ways for how to improve the winemaking processes in the wine cellar in order to produce healthier wines. First, before we continue talking about the development of Vin Natur, let us take a step back and define what parameters make a wine natural. Some of you might already know it and some of you might not. make no use of clarification, microfiltration, added sulfites, or other. During the initial membership screening, the board does a wine tasting to analyze the wines of the prospective member. If they find any sign of non-natural aromas or flavors such as banana, peach, tropical fruit, or similar in the wines, the application gets rejected. If a wine producer passes this first screening, his/her wines are then sent for a chemical analysis to determine that there are no traces of pesticides, herbicides, or other such substances. 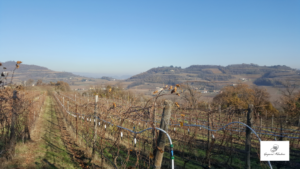 The use of copper and sulfur is allowed for treatment in the vineyards even though they are constantly researching other more natural substances. With this resolved, they instead realized they had to move forward and invest in scientific research in order to take the natural winemaking to a new level. Therefore, they started collaborating with different university departments in, for example, Trieste and Udine. The aim was now to make more enjoyable and drinkable wines. They thus turned to different specialists within the fields of molecular biology, entomology, and botany. What they found out is that the ecosystem and its biodiversity is of great importance as well as the terroir and having a clear idea of the predators and the preys in nature. As you can see, after 2006, their focus changed from being preoccupied with the processes in the wine cellar to entirely focus on the vineyard and the soil. As the research went forward they would soon have another ‘Aha‘ moment…i.e. they realized that they needed to change their perspective completely. This means that you need to have the soil as a starting point, from there you can manage the vines growing in the vineyard. Thus, they went from an ‘above’ to a ‘from below’ perspective, so to say. The soil needs to be healthy in order to nurture the vineyard. A disease on the vines is a result of something lacking in the soil, according to Vin Natur, and not caused by something attacking the vines independently of the soil. A preemptive approach is therefore needed in order to make sure that the microorganisms and the ecosystem in the soil are as they should be. 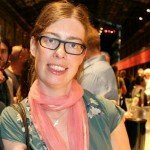 An even more innovative step in research has been to involve experts in computer science and neuro mathematics to build a model for the ideal vineyard based on the earlier research results. This makes it possible to constantly adjust and move forward in their work towards the ‘dream’ soil and vineyard for the production of optimal natural wines. The research Vin Natur carries out and all tests made on wines for chemical analysis are financed by the association. 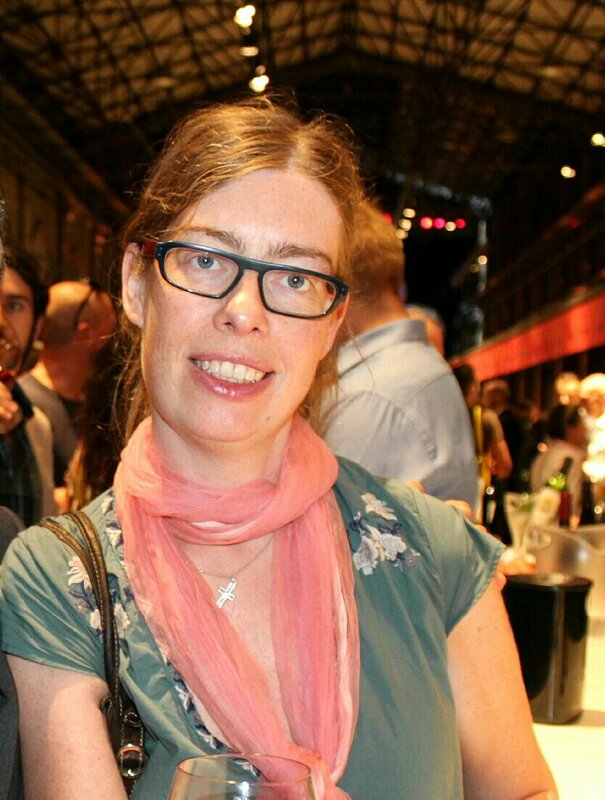 Vin Natur organizes three different wine fairs every year to raise funds for all their work. 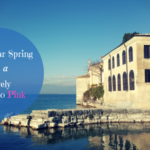 The most important of the three wine events is Villa Favorita that takes place in April every year. Let us now take a look at the vineyard of La Biancara. 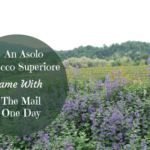 Below, you can see the live video I did on our first walk in Angiolino’s vineyards. We did, of course, not visit La Biancara to listen to everything about Vin Natur without getting the opportunity to taste some wines. 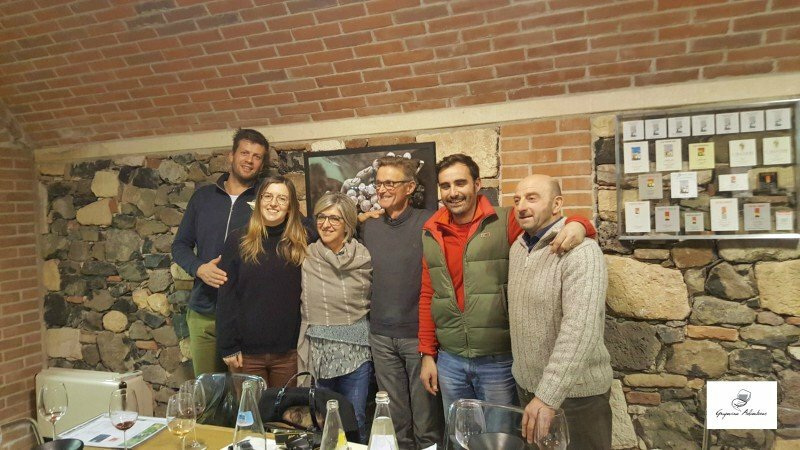 During the day we met some Italian wine producers that are members of the association, who came and talked about their journey towards producing natural wines. During lunch time (a lunch prepared by Angiolino’s wife) as well as later on during the afternoon and the following dinner we got to taste a selection of different Vin Natur wines. At the lunch, I very much enjoyed the slightly fizzy (frizzante) and fruity Moki Pinot Grigio IGT from Azienda Agricola Masiero. 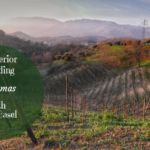 This is another small biodynamic winery located not far from La Biancara in Veneto. Another wine we had to taste at lunch was La Biancara’s own Sassaia 2007. This wine is proof that natural wines indeed can age. The minerality, the citrusy notes, and a bit smoky undertone combined with its freshness makes it into a lovely wine. An interesting wine to me, who loves to learn more about indigenous grape varieties, was the Particella 128 Vino Spumante Metodo Classico Dosage Zero 2016 from Cinque Campi winery close to Reggio Emilia. This sparkling wine is made with the lesser known grape variety Spergola. This is a mineral wine where the floral and fruity, mostly apple and citrus, notes are predominant. On the palate, you feel both the freshness and a bit salty touch. Spergola is a grape variety that had become a bit forgotten during many years, often also being confused with Sauvignon Blanc. In the 15th and 16th centuries, it was indeed a very much appreciated grape both by nobility and the Pope. Today, it is mainly cultivated in the Reggio Emilia area in Emilia-Romagna. During the day, we also met with the producers Daniele Piccinin, the wife, and daughter of Gianfranco Masiero (the wine I mentioned above), Claudio Rosso from Cascina Roera in Piemonte, and Sauro Maule also from Veneto. And no, he is not related to Angiolino Maule. I very much enjoyed all their wines even though in this article there is not much space to enter into detail about every single producer. The Muni Arione Vino Spumante (2016 I believe) from Daniele Piccinin is a natural sparkling wine made with the grape Durella. It is a smooth and elegant bubbly wine with fruity notes. Cascina Roera produces several different both white and red wines. One of the wines we tasted was Cardin Vino Rosso which is a blend of 85% Barbera and 15% Nebbiolo. This is a wine with a good acidity where the red fruit is very dominant followed by a more balsamic undertone. Below you can listen to Claudio talk more about his wines. When it comes to Sauro Maule, we tasted, for example, his Veneto Bianco IGT Granselva 2016 which is a blend of the grapes Garganega, Durella, Pinot, and Chardonnay. This is a very drinkable and enjoyable white wine with floral as well as more ripe fruity notes. 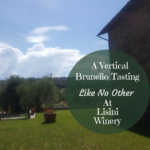 This has turned into a very long article, but there was so much to tell about the day with Vin Natur that it was difficult to be short and concise. I hope I have managed to transmit to you the passion and the organization behind everything they do in the association. We learned about how they see the soil as the fundamental element with a vineyard above and not vice versa. How the microorganisms and the ecosystem are important for growing healthy vines. One of the more interesting things for me was just to learn about all the research they are doing to understand how to move forward and make better and healthier wines. 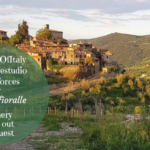 For those of you who would like to know more about Vin Natur or where to find the wines, why not go to Villa Favorita wine fair close to Vicenza in April…? Angiolino appears to be one passionate man. And Vin Natur an extremely dedicated organization! Seems focusing on soil health is positive, the dream soil concept interesting. Nice article Katarina! Thanks Lynn, for your comment. 🙂 Yes, they are a very passionate and dedicated organization, eager to innovate and do research to do better wines.